VEGAN VOLUMIZING HAIR RANGE. - CRUELTY-FREE BECKY. My general aim in life is to obtain Brigitte Bardot-style big bouncy hair. It's just one of those things I've always pined for and at this stage I'm pretty much willing to try every vegan volumizing shampoo on the market to achieve it. 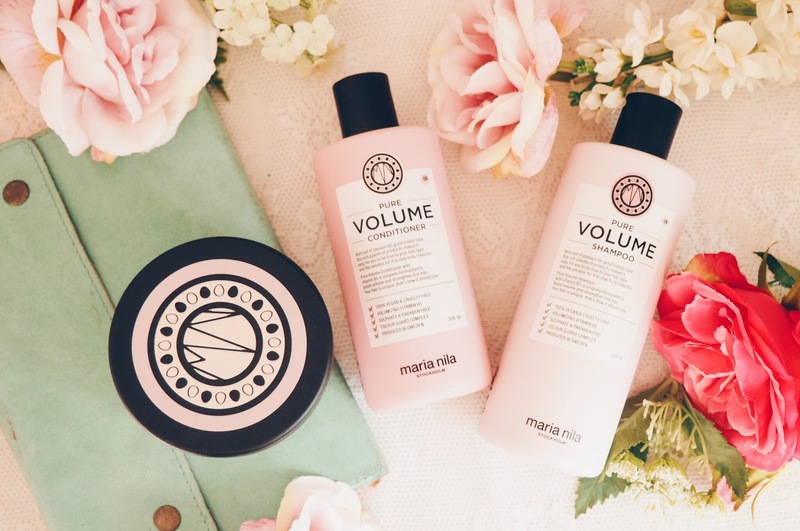 Here's how I got on with Maria Nila's Pure Volume range, very kindly sent to me to review. Maria Nila are a Swedish haircare brand with a range of entirely cruelty free and vegan products. Their vast range caters to various hair-related needs, including a line of colour-refreshing duos, heat protectants and styling creams. It must be noted that these are not for those of us on a budget, with each product priced at around €29. This isn't necessarily a bad thing, as there is definitely a market for luxury vegan products at the moment, but it means that they definitely have to deliver on their claims for me to want to recommend the splurge. The brand sell online and instore at Sally's, as well as distributing to hair salons. I tried out their Pure Volume range consisting of a shampoo, conditioner and hair mask. They are all sulphate-free and paraben-free and are said to 'boost volume and strengthen fine hair'. I had heard multiple cruelty-free bloggers rave about this brand and was also recommended it by my friend who loves the Structure Repair range. I have hair that is in good condition but is quite thin, so I figured the volumizing range would be a better fit for me (but if you have thick hair that needs a little taming, then she swears by the Structure Repair Shampoo). Overall, these products are pretty nice, but I do have some qualms with them. Starting with the positives, these smell amazing. They remind me of the scent of Aussie haircare (no, Aussie are not cruelty-free but just using them as a reference scent). The packaging for this range is also really beautiful. The pink theme is right up my street, and the bottles feel really luxurious with a soft-matte touch (maybe a random thing to note as doesn't add to the product's performance). They do create some volume at the root of the hair as well as cleaning it nicely (duh... I should expect so at £25 a pop). This lift is what I'm after. As I mentioned earlier, I have quite thin hair these days because when I was younger I decided (as a pale Italian with naturally very dark hair), that I wanted to dye my hair light blonde. With no bleach. Just straight in with an at-home 'Light Honey Blonde' kit. Hah hah. Ha ha. It went bright orange/red. I wore a massive fluffy hat to school in the middle of summer and had to take it off for assembly. My friends laughed a lot. It really was tragic, and a massive mistake, and after that point I had to dye my hair many many times in a short space of time to try to get it back to dark brown, which left it pretty damaged. These products gave my hair some lift, but nothing revolutionary. I was expecting more va-va-voom. The main drawback of these products for me is that they contain silicones. I'm only just starting to take notice of silicones in hair products, but if I use too many products containing them I notice my hair feels (and looks) a lot more weighed down. This is pretty counter-intuitive, seeing as I'm after more volume, not less. Also these products are not cheap, and for the steep price they really should deliver on their claims, which I'm not sure they do. As you may be able to tell, overall, I have mixed feelings about these products. I was expecting to love them, and I don't. As I was kindly sent these to try out and review, I feel bad that I can't say more positive things about them. Of course, just because you get gifted something by a brand, it doesn't necessarily mean that the review you give has to be positive, but it does makes me feel a little ungrateful/rude to be really negative about them. Nonetheless, I think it's very important to give an honest review, so that's what this is. The brand are lovely and I love what they stand for, but would I buy these myself? Nope. I would not. And that's the bottom line. Have you tried any Maria Nila products? Should I try a different range from them? Let me know! I really want to find an affordable and great quality set of cruelty free hair products so I really appreciate your honesty in this! Thanks so much my sweet! The search continues ey haha.